Festival is usually held on the last weekend in July. This is Willunga's major annual fund raiser for it's Recreation Park Facilities, which include the town oval and town halls. Thousands turn out for the main weekend festivities and the ball is usually booked out well before the night. Book your accommodation as soon as possible, so you can enjoy this year's festival. Willunga will burst into life this winter as it celebrates the annual Almond Blossom Festival. Youth bands, dance groups, show rides, fashion shows, Free Family Fun (12noon-3pm) on the oval near grandstand (see map below). Entry $2, children under 5 admitted free. Show rides, children’s entertainment including The Amazing Drumming Monkeys and Splodge, pony rides and baby farm animals, market stalls, food, wine, bands and so much more. 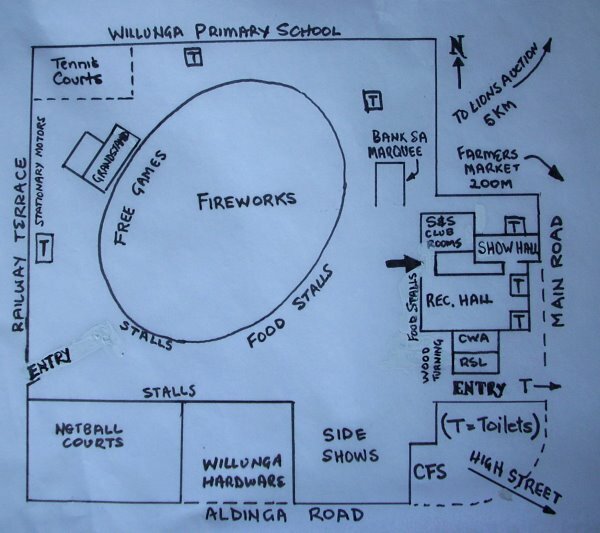 Free Family Fun (11.30am-3pm) on the oval near grandstand (see map below). Held in the Festival Hall, the lunches have been a long-standing tradition. Come along for a 3-course lunch and enjoy entertainment from the local schools. Bookings are recommended so phone Rhonda on 8556 4300. Dust off the glad-rags and hit the red carpet for the biggest night in town. This year we bring you Hollywood – A Night With The Stars, hosted by Andrew ‘Cosi’ Costello from Channel 9/Triple M and featuring entertainment by Adelaide songstress and cabaret performer, Amity Dry and The Hepburn Band. Tickets $25 go on sale Monday 4 June. No part of this website may be copied in any medium except as is allowed by copyright law. Copyright 2004, 2005, 2006, 2007, 2008, 2009, 2010, 2011, 2012 by Willunga Media, Box 319, Willunga, SA 5172.